Construction began on Forest Highway 43, also known as Prince of Wales Road, in spring of 2012. 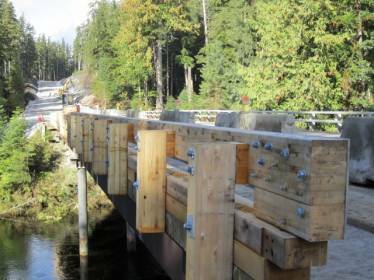 Funded by the US Forest Service, the Federal Highway Administration, and the Alaska DOT, the project will add pavement to the previously gravel road, improve drainage, and install guardrails. 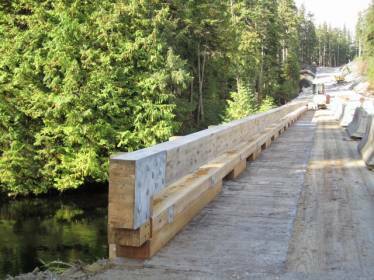 Changes to the current roadway will improve transportation opportunities for nearby communities to access forest resources. The job is scheduled for completion in May of 2015. 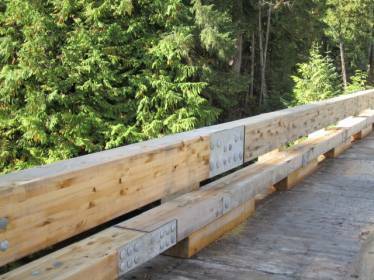 In spring of 2014 Portland Bolt was contacted by the contractor on the project to provide the fasteners on the 160’ long timber bridge that crossed a section of water on Prince of Wales Road. Since the job was federally funded, all of the fasteners of the project were required to be American made. 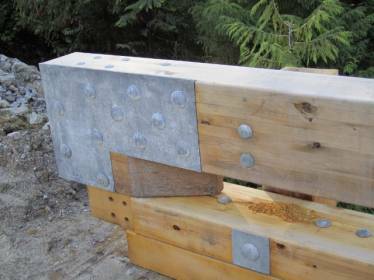 Portland Bolt was able to produce the custom square bend hook bolts, timber bolts, lag bolts, and drift pins in a lead time that allowed the project to stay on schedule. Portland Bolt domestically manufactures custom fasteners for federally funded projects all across the country in our 94,000 square foot facility in Portland, Oregon. Our certification packages are the most thorough and complete in the fastener industry, providing detailed traceability on materials all the way back to the steel rolling mill. Contact one of our experienced estimators on your next project and let us do what we can to keep your job on schedule.